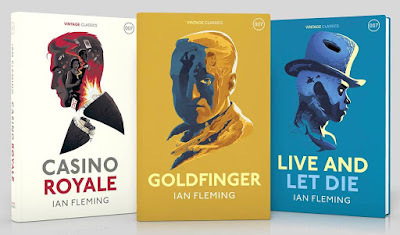 Ian Fleming Publications has officially revealed the three new James Bond hardcovers to be released by Vintage Classic in the UK in November. The books include new introductions by John Cork. Introducing, new Ian Fleming hardback special editions of 3 of James Bond's finest adventures. Vintage UK will be releasing these fantastic new editions of CASINO ROYALE, LIVE AND LET DIE and GOLDFINGER in November 2017. The editions include brand new introductions from Bond expert and writer John Cork, with scintillating new designs by Brisk Graphics artist Levente Szabo. Pre-order from Amazon.co.uk: Casino Royale | Live and Let Die | Goldfinger. I would prefer swapping "Live and Let Die" with "On Her Majesty's Secret Service", instead. Oh yes. OHMSS would have been an excellent choice. Hopefully they will do more.